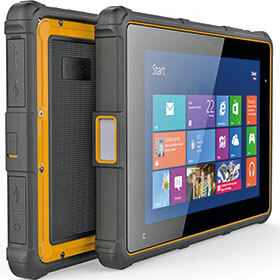 RJ Connect has announced the launch of its new rugged tablet, the Windows HR 802-RG. This ‘worker-proof’ tablet, with CPU: Intel Bay-Tray Z3735F Quad-core turbo 1,8 GHz, boasts two cameras as well as GPS and barcode scanner. The tablet comes standard with Windows 10, WiFi and Bluetooth 4.0 capabilities, as well as 2 GB ram and an additional 32 GB SSD. The 8” display, with capacitive multi-touch IPS screen at 1280 x 800 pixels, operates in temperatures from -10 to 50°C. Optional extras include fingerprint scanner, external battery, handheld belt, docking station and support for 2D code.